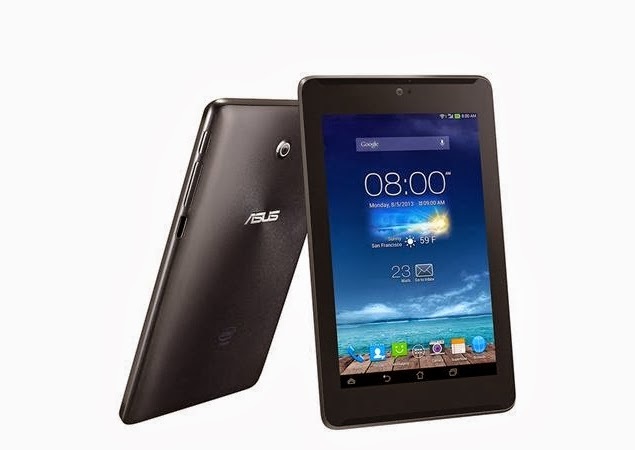 Asus Fonepad 7, the new tablet PC by Asus launched in India. The tab support voice and video calling facilities, it priced at RS. 17,499. Asus Fonepad 7 is loaded with Android 4.2 Jelly Bean operating system and powered by 1.6 GHz dual core processor that mounted on Intel Atom Z2560 chipset. 1 GB RAM included for easy multi-tasking and 16 GB internal memory included for data storing needs, It support up to 32GB external memory using Micro SD card slot. The Fonepad 7 comes with 7-Inch capacitive multi touchscreen with IPS technology, 800x1280 pixel screen resolution, & 16 Million colors. The device built-in with 5.0 MP rear facing autofocus camera and 1.2 MP front facing camera for making video calls. Included connectivity features are Wi-Fi (802.11 a/b/g/n, dual band), 3G (with HSPA+, up to 42 Mbps download speed & up to 5.7 Mbps upload speed), GPRS, EDGE, Bluetooth (v3.0), USB (2.0) and GPS (with A-GPS support & GLONASS). Asus Fonepad 7 built-in with 3950mAH powerful battery that gives up to 35 days stand-by time, up to 25-hours talk time on 3G network, & more than 10-hrs video playback. The dimension of Asus Fonepad 7 is 196.8 x 196.6 x 10.5 mm and 340g weight. The tab comes in 2 color variants, Diamond white & Sapphire black.